During the 18th century the religious tension of the Order decreased ostensibly. There was no shortage of select personages or groups of Religious who, with their fervour and apostolic surrender, ennobled its old structures. But with excessive frequency natural motives prevailed: Legalism and indiscriminate recourse to custom; the mystical spirit and missionary decrease, in the same measure as the growing aspiration to a more comfortable life, and a thirst for honorary titles with their litany of privileges and exemptions. Fruits of, and at the same time, symptoms of this spiritual listlessness are; the numerical and territorial stagnations of the community; the routine, and, the decadence of the life in common. 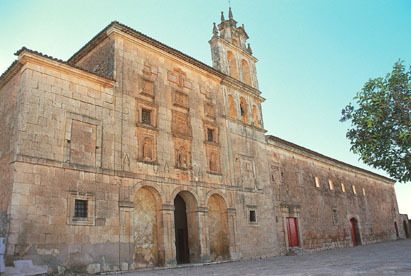 Convent of Campillo de Altobuey, Cuenca. Between 1688 and 1824 the Order didn’t succeed in opening as much as one house in Spain. By the middle of the 17th century the number of Religious reached 1,500, and thus it remained during one and a half centuries. In 1808 the number had fallen to 1,100, of which 900 were living in Spain, with the rest in Columbia and the Philippines. Constructive activity was intense. Some devotions proper to the Order were strengthened, (The Virgin of Consolation, Saint Rita etc. ), and the number of Religious living in parishes and extra-monastic chaplaincies became more frequent than was desirable.